Lesson 1: Friendship can be found in unexpected places, like at street food stands or in a packed microbús. Lesson 3: “Barriga llena; corazón contento.” (Full belly, contented heart.) Always travel on a full belly, lest you subject your travel companions to the wrath of a hangry heart. Lesson 4: A pretty place is nice to look at, but true beauty is found in friendship. Thanks to my travel buddies, to our hosts, and to the many, many people who fed us and welcomed us into little-known corners of this incredible country throughout the past week. Feed yourself regularly. You can get hangry even if your stomach isn’t registering hunger. Take every possible opportunity to fling yourself naked into a body of water. Bus rides through Guatemalan countryside are really fun in you don’t mind catching some air. Eat every mango you can lay hands on, for who knows when it shall be thy last? Donde caben dos, caben tres (o seis o diez). Aka, a bus is never truly full. It’s scary to climb a waterfall, but also, once you’ve done it, you’re on top of a waterfall…so, worth it. Talk to anyone and everyone. Your Spanish is good enough. Travel with people who aren’t afraid to wander slowly and aimlessly because that’s how you stumble upon the best hidden treasures. Take in everything with wide eyes and an open mind; don’t be afraid to slow down and marvel. Sometimes scorpions lurk in backpacks and you have to catch them in your water bottle and stare at them for a while. Do not benevolently release them into the wilderness because they will sneak back into your room and attack you in the middle of the night. You can hop in the pickup truck of a total stranger and come out alive. Stranger danger is not always a thing. Trust people. Guatemala is a beautiful country filled with wonderful and kind people (but you already knew that). I have never seen mountains like Guatemala’s before. They breathe green into every corner of my sight and astound me with the steepness of their reaching slopes. I could stare and stare and never get enough of their majesty. 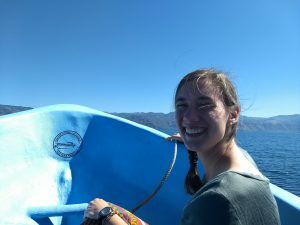 Our group of three spent three days in Rio Dulce and three days in Lívingston, choosing to save money and spend less time traveling by staying in Guatemala. Although if you think about it, the money we were given for free travel wasn’t just handed to us – it was originally ours that we used to pay tuition for this semester. Still, it felt like Byron and Lisa were just giving us money to travel. I can’t write about grand adventures or discoveries, but I can write about what the three of us felt so strongly throughout the week; the restorative power of doing nothing: of sleeping in, of reading novels on a roof or by a pool, of not having scheduled times to eat or sleep or be in Spanish class or to be somewhere. For the first time all semester, except for a few days in Arizona, we had no planned activities, and it was glorious. Combined with the scenery, we could not have asked for a better, more relaxing week out of the city. We were very thankful that our first two days of travel to Placencia, Belize were not an indication of how the remainder of our free travel would go. 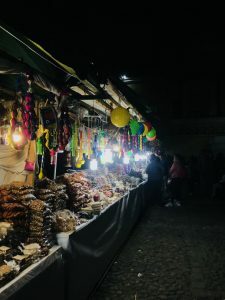 Traveling in Guatemala posed more challenges than we would have had while traveling in the United States because we were not able to plan much in advance. We could not look at bus and boat schedules online leading us to always take the earliest bus/boat to make it to our next destination just so that we could sit and wait a long time for the next one to leave. Making it even more difficult, we had to keep track of three different currencies (Quetzales, USD, BZD), two different languages, as well as our group and the other two groups. And, on top of all of that, we had to deal with Guatemalan time. This means that nothing leaves or arrives on schedule and there is no rush. 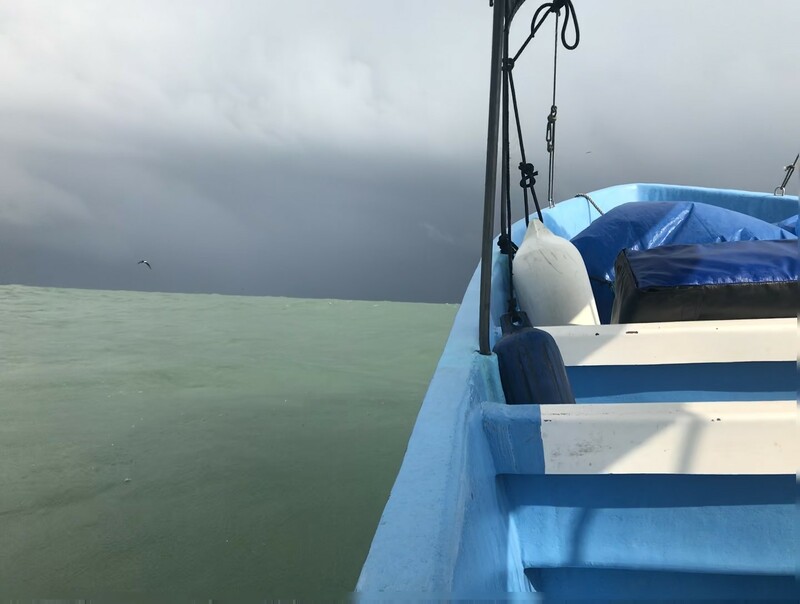 The most stressful part of our travel was an hour boat ride from Livingston, Guatemala to Punta Gorda, Belize that took up the largest portion of our transportation budget during the middle of a storm. We were sitting in a 20-passenger boat that was open on all sides, and thrown around by the wind and the waves. The torrential rain started when we could no longer see any sign of land. We stopped to refill on gas during this downpour and we were convinced that we were lost. However, we started moving across the open ocean again and finally caught sight of land. The rain stopped, the sea calmed, and we no longer had to huddle under the tarps, praying and holding hands. 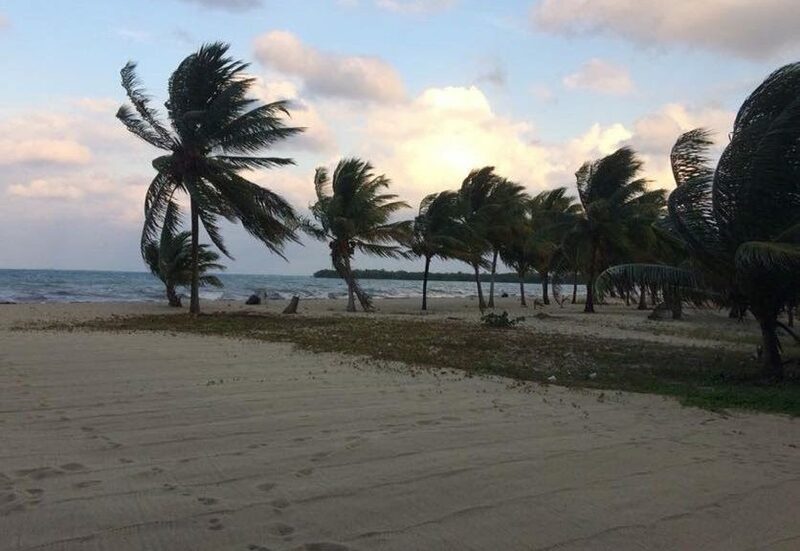 All of these struggles made the beaches of Placencia more beautiful and enjoyable. We spent the next 5 days 40 feet from the beach, enjoying the luxuries of air conditioning, warm showers, speaking English, and independence in our food and activities. One of our highlights was eating Tutti Frutti gelato almost every night. We loved the small town feel of Placencia and the ability to walk everywhere. Most of the shops and restaurants were located on the main sidewalk that provided easy access to the beach and the whole town. Despite our traveling difficulties, we all agree that Placencia was well worth it. We would all love to go back another time to experience everything we did not do and to re-experience some of our favorite memories. Our group, like a few others, was lucky enough to explore the beautiful, tropical country of Belize for our free week of travel. From the very first day, our trip went so smoothly it felt too good to be true. We left at an early 2:30am and took a variety of transportation to reach Puerto Barrios, Belize, where we ate pizza and had a relaxing night on the balcony, looking out over the ocean. Throughout our journey to Placencia, Belize, our final destination, we walked, took 3 taxis, 2 boats, and 2 busses. This long journey made Placencia even more enjoyable upon arrival. 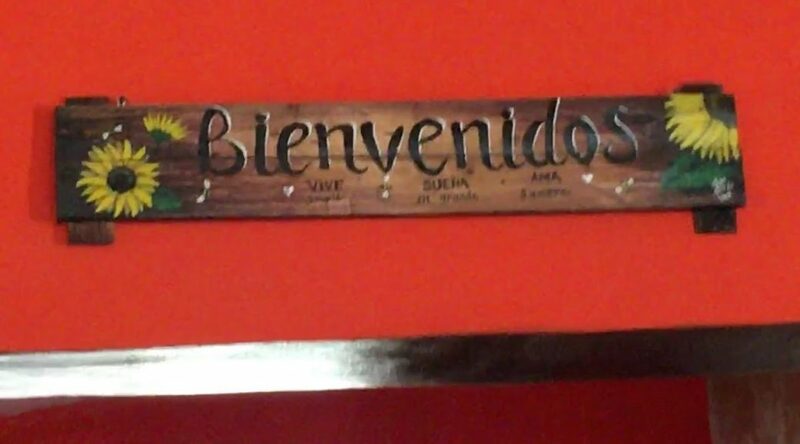 After getting off the boat, we were all surprised to be welcomed in English, a nice change from the ongoing Spanish we had been hearing and studying in the city. We were greeted by our gracious and hospitable host, Analise, who provided us with a house located right on the lagoon and included a rooftop pool, kayaks, tubes, bikes, and a beautiful lounging area where we spent most of the week. Analise and her boyfriend even cooked us a delicious barbeque meal during our time there. Placencia is a small lively town located on a peninsula where the tropical air, bright blue oceans, and unique restaurants and bars welcome many tourists from all over the world. Unlike Guatemala and Mexico where we had previously visited, Belize offered a different atmosphere and culture. Placencia provided us with a sense of community, safety, and an overall island vibe that was thrilling to explore. During our time in Placencia, we visited the beach, made our own meals (mostly consisting of pasta), lounged at our pool, and sun-tanned. On the last day, we were able to take a boat out to a secluded island to snorkel! We saw schools of fish, a rainbow squid, and multiple stingrays. We felt so free swimming and scanning the coral reefs that reside under the Belizean blue waters. Until our travel day back, every aspect of our trip was perfect. On the way home, we ran out of gas on our boat, which caused us to miss our bus back to the city. This was quite an experience, but we all made the most of it and embraced the unpredictability of travel. Overall, our trip to Placencia was an unforgettable adventure, and turned out to be the perfect, much-anticipated break we needed. During our weeklong adventure throughout Guatemala, we stopped in Semuc Champey for a couple of days. This is one of Guatemala’s most famous and most beautiful national parks, and it is preserved perfectly. It consists of a river flowing into naturally formed pools with a small waterfall cascading into each pool. The water was extremely clear and very refreshing to swim in. But the swim was not without a price, the rocky path to the pools were both sharp and slippery. Somehow, none of us took a spill and despite the danger, the view from the pools was absolutely worth it. From the water, we could see down the river valley into the sunset over a distant mountain range. All in all, it was a fantastic trip full of conversations with interesting people, beautiful scenery and long, long, long bus rides. We’re back from five breathtaking days in Guatemala’s Alta Verapaz, where we stayed with the organization Community Cloud Forest Conservation, led Rob and Tara Cahill, along with teachers and staff from the surrounding Q’eqchi’ communities. 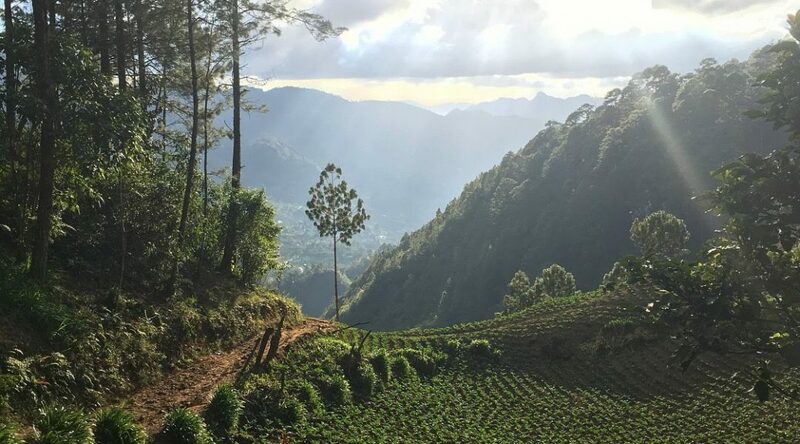 CCFC is working with the conservation of the rapidly diminishing cloud forest, as it intersects with the lives and well-being of the people who live there. The work of this organization is far-reaching. There are two main community programs: Kids and Birds, which is a summer-camp-style environmental education experience for children, and Women in Agroecology Leadership for Conservation (WALC). Through WALC, young women learn life skills and leadership, but also plant agroforestry plots, as an alternative form of agriculture that both repairs degraded forest areas and can be a source of nutritionally dense food. CCFC is addressing both social and environmental issues holistically, and coming up with some wonderfully creative solutions. During our five days in the cloud forest, we spent three nights in the CCFC facilities, which are filled with windows, light, and wood. The facility was built with careful attention to resource conservation. 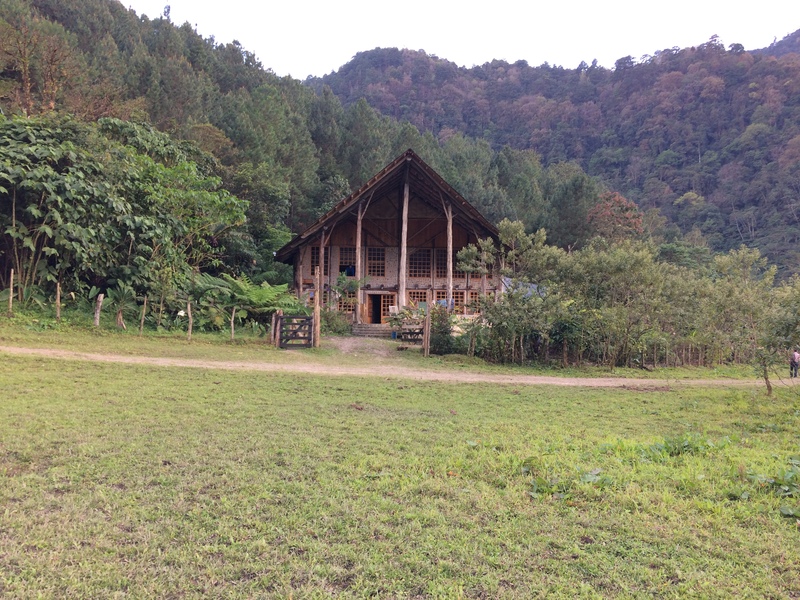 We got to experience composting toilets, showers heated in pipes that ran through wood cook stoves, and meals featuring ingredients like cloud forest spinach. It felt like there was no boundary between “indoors” and “outdoors.” We got to spend a lot of time outside in the cloud forest. We hiked through the forest two different days, both times reaching caves that were historically places of Mayan worship. Our other two nights were spent with host families, which we all agreed was one of the most difficult things we’ve done so far on this cross-cultural. We were living in houses perched on the edges of the mountains, in the community of Sebob. While there, we ate meals cooked around a fire, interacted with the intergenerational families who were hosting us, and played a lot of soccer. 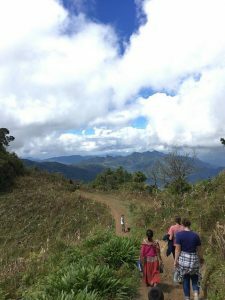 We wheezed up steep hills (our host siblings nonchalantly sprinting ahead of us), slept on boards, bundled in all of the clothes we’d packed, and tried our best not to cough as billows of smoke from cooking fires hit our faces. Even in writing that, I am cringing a little bit. We all know how incredibly privileged we were to be there, how hospitable our host families were, how little we have to complain about in our daily lives. As we walked down that mountain for the last time, I wrestled with feelings of guilt at the bit of relief I felt at returning to the CCFC buildings, with their hot showers and soft beds. These mixed feelings of gratitude and guilt linger with me, as I return to life at school in the city. Last Tuesday after classes, everyone loaded into the CASAS minivans on an unusual tourist excursion. 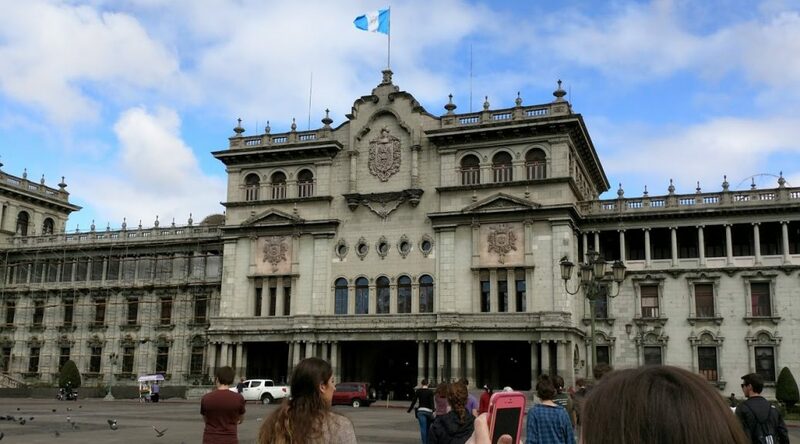 We were not headed to the national museum, nor to the presidential mansion, but to the cemetery: a resting place for some of Guatemala’s wealthiest elite that also happens to overlook the city dump. We arrived to elaborate cast iron gates set in a high stucco wall that insulated the cemetery from the noise and bustle of the city. Inside, we found cyprus-draped roads lined by magnificent mausoleums, crumbling monuments, and elaborate marble statuary boasting the remains of some of the city’s best-known generals and politicians. The silent streets were in a surreal state of leisurely decay: gothic spires crumbled after years of neglect, joining the ruins of the long-forgotten Mayan tombs over which the graveyard was constructed in the mid-19th century. Only the monuments of the immortally wealthy—such as the massive [Egyptian] pyramid built in tribute to the Castillo family—escaped the general atmosphere of deterioration. 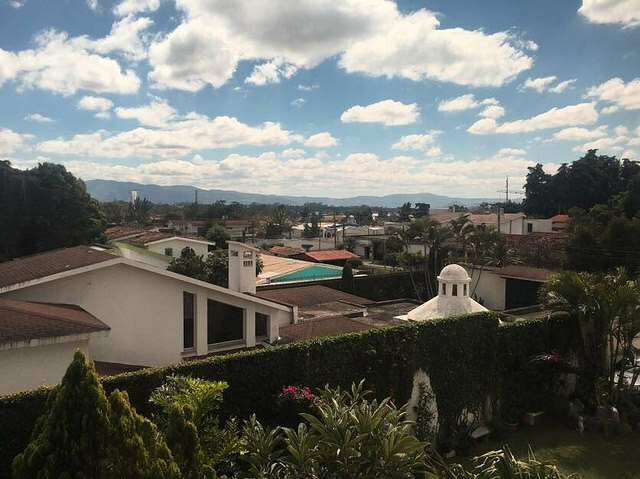 Last Thursday, I woke up early and stepped outside into a gorgeous, sunny, Guatemala morning. It was our first day at CASAS. After a long day of airplane rides and a late night arrival, it was refreshing to finally begin the second part of our journey. 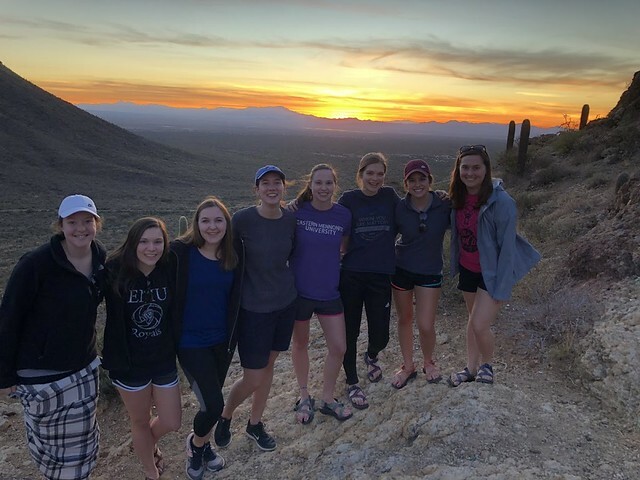 The group was surprisingly animated for a short night’s sleep, probably due to anxieties surrounding our upcoming events: our first day of Spanish classes and the introduction to our host families. A walk through the beautiful flora and fauna of the CASAS courtyard helped to put our minds at ease. It has now been week since we first arrived. The excitement and anxiety surrounding our recent arrival has subsided, replaced by the comfortable consistency of routine. Every day, I wake up around 6 a.m. to quickly take a shower before my host brother, Jacobo (35), gets out of bed. My breakfast, a bowl of cereal and a cup of instant coffee, is waiting for me on the table thanks to the hospitality of mi madre, Gladys. My sister, Andrea (25), left the house before I got up and won’t return until I am already asleep since she works during the day and goes to the university at night. She barely sleeps. Jacobo takes my two friends, Anali and Elizabeth, and me to CASAS every morning. We arrive about an hour early so we have plenty of time to relax in the courtyard, drink some coffee, do some homework and talk with the rest of the group members as they slowly trickle in. Spanish classes start at 8:30 and go until 12:30 when we have an hour break for lunch. The afternoon activities vary depending on the day. 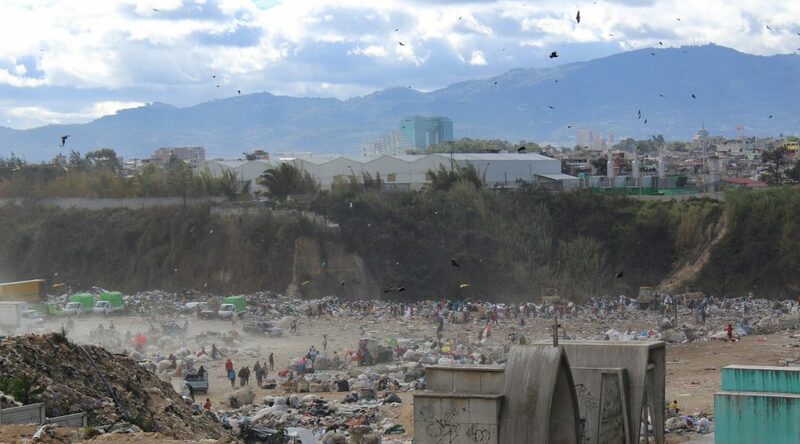 Early this week we visited the city dump where hundreds of people dig through the trash to find things to recycle for a paycheck of 10 quetzales a day (about $1.40). It’s the 4th generation of workers that has been born and raised in the dump. We also visited a gorgeous outdoor mall that would rival some of the nicest malls in the U.S. which was a stark contrast from the dump we had been the day before. After school, Elizabeth, Anali and I are either picked up by one of our family members or ride the bus back home. I knock on the big metal door that guards the entrance to my family’s house and mi madre greets me at the door. I sit for a while and converse with her and the family friend Narda about our days. My siblings arrive at various times throughout the night. Monica (32) comes home from her job as an architect around 6:30 and Jacobo comes home around 8:00. My other brother Manolo (34), gets home on his motorcycle around 8:45 and we spend some time together conversing, playing games or watching T.V. I crawl into bed around 10:30, exhausted from a long day of dual language conversation. 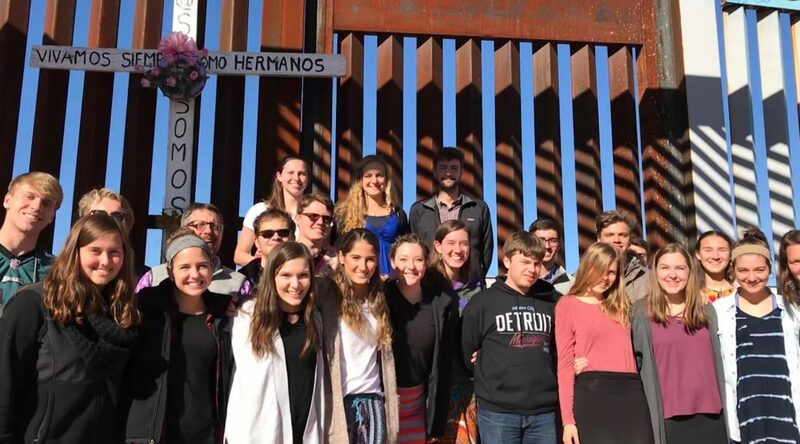 Despite the lack of sleep, I look forward to waking up every day to watch the group grow closer, understand the language more clearly, and encounter new experiences in unfamiliar contexts.